Ramirez began performing with Bud Gaugh (also formerly of Sublime) and Wilson in 2009, where they played under the name "Sublime", until Nowell's estate issued a legal challenge to the use of the trademarked name for a venture not including Nowell. As a result, they changed their name to "Sublime with Rome" in January 2010. The group played at the 2009 Smokeout Festival and embarked on their first tour in 2010, before releasing their debut album, Yours Truly, on July 12, 2011. Gaugh left the band on December 10, 2011, and was replaced by Josh Freese. The lineup of Wilson, Ramirez and Freese recorded the group's second album Sirens, which was released in 2015. Sublime with Rome's third lineup change took place in 2017, when Carlos Verdugo replaced Freese. In February 2009 Gaugh and Wilson reunited for a show in Nevada and called themselves Sublime. They were joined by a new singer-guitarist whose identity was not announced; on March 1, 2009, Gaugh confirmed this was then-20-year-old Northern California native Rome Ramirez, who had previously collaborated with Wilson on RAWsession where he played Sublime songs such as "Saw Red" and "Boss DJ". The trio played another show at Cypress Hill's Smokeout Festival on October 24, 2009 in San Bernardino, California. The festival also featured performances from Kottonmouth Kings, Slipknot, Deftones, Bad Brains and Pennywise. “ It was recently announced that Sublime bassist Eric Wilson and Sublime drummer Floyd 'Bud' Gaugh are 'reuniting' and teaming with singer and guitarist Rome Ramirez in a band they intend to call 'Sublime.' Prior to his untimely passing, both Bud and Eric acknowledged that Brad Nowell was the sole owner of the name Sublime. It was Brad's expressed intention that no one use the name Sublime in any group that did not include him, and Brad even registered the trademark 'Sublime' under his own name. As Brad's heirs, and with the support of his entire family, we only want to respect his wishes and therefore have not consented to Bud and Eric calling their new project 'Sublime.' We have always supported Bud and Eric's musical endeavors and their desire to continue to play Sublime's music. We wholeheartedly supported Bud, Eric and the many talented members of the Sublime posse that formed the Long Beach Dub All-Stars, soon after Brad's death, to honor him through their original recordings, live performances and Sublime music until they disbanded in 2001. But, out of respect for Brad's wishes, we have always refused to endorse any group performing as 'Sublime,' and now with great reluctance feel compelled to take the appropriate legal action to protect Brad's legacy. Our hope is that Brad's ex-bandmates will respect his wishes and find a new name to perform under, so as to enhance the 'Sublime' legacy without the confusion and disappointment that many fans have expressed upon seeing the announcement. 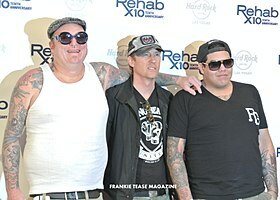 Gaugh told Billboard.com that new material from Sublime with Rome was in the cards. [clarification needed] The trio wrote three new songs when it first started playing together in February 2009, including one, "Panic", that was performed at all three shows they had done so far. He explained, "We're gonna continue working on material as we're on the road. It's not without question to have a studio in one of the buses while we're on tour. We do a lot of our best creativity on stage, so we'll be trying out new stuff for the fans, even before we go into the studio." By 2013, Sublime with Rome was expected to return to the studio to record their second album. On May 13, 2015, the first single from then-upcoming album Sirens, titled "Wherever You Go", was released on YouTube. A second single was released on YouTube and iTunes, titled "Sirens (Feat. The Dirty Heads)", on June 29, 2015. Sirens was released on July 17, 2015. In early 2017, Josh Freese was replaced by former Tribal Seeds drummer Carlos Verdugo. Soon after, the band announced a North American summer tour with The Offspring and The Menzingers. Currently, the band is recording their third studio album for a 2019 release. The album is being produced by Rob Cavallo and will be released through RED MUSIC. ^ a b "Sublime, "Born Again, With Rome"". Billboard.com. September 14, 2009. Retrieved September 28, 2011. ^ "[WORLD PREMIERE] Sublime with Rome Release First New Single "Panic"". Kroq.radio.com. Archived from the original on May 9, 2011. Retrieved September 28, 2011. ^ Blackout (December 10, 2011). "Breaking News: Sublime with Rome Drummer Bud Gaugh Leaving Band to Focus on Family – Almost Acoustic Christmas To Be Band's Final Performance". KROQ.com. Archived from the original on January 13, 2012. Retrieved December 11, 2011. ^ Del Mar & Sublime. Last accessed February 4, 2010. ^ "Sublime To Reunite For Cypress Hill's Smokeout Fest". Billboard. Retrieved July 15, 2015. ^ "Sublime Reunion Show Sparks Controversy". Billboard. October 23, 2009. Retrieved July 15, 2015. ^ Judge's ruling could put a damper on a Sublime reunion. Last accessed February 4, 2010. ^ BREAKING: Sublime Lawsuit Settled; Showdates Planned Archived May 17, 2011, at the Wayback Machine. Last accessed February 12, 2010. ^ A Q&A with Sublime founding member/drummer Bud Gaugh[dead link]. Last accessed February 4, 2010. ^ "Sublime Settles on New Band Name, Plots Tour". Billboard.com. September 14, 2009. Retrieved September 28, 2011. ^ "Sublime with Rome". Sublime with Rome. Retrieved September 28, 2011. ^ "Interview with Rome Ramirez". Music Emissions. Retrieved September 28, 2011. ^ "Niet compatibele browser". Facebook. Retrieved September 28, 2011. ^ "SUBLIME WITH ROME Debut New Song "Panic" on Jimmy Kimmel Live " News "". Puregrainaudio.com. Retrieved September 28, 2011. ^ "Sublime with Rome Signs to Fueled by Ramen". Sublime with Rome. Retrieved March 20, 2011. ^ a b c d "Bud Gaugh Exclusive Interview by Erik Schaefer of SWRfans.com". budztv.com. Retrieved January 12, 2012. ^ "Musical Riot". ieweekly.com. June 3, 2013. Retrieved June 3, 2013. ^ "Sirens Announced". Sublime With Rome. May 13, 2015. Retrieved May 13, 2015. ^ "Sublime with Rome: New Drummer". theislandsound.com. January 30, 2017. Retrieved March 15, 2017. ^ [ "Sublime with Rome - Chart History: Billboard 200". Billboard. ^ "Sublime with Rome - Chart History: Top Rock Albums 200". Billboard. ^ "Iron & Wine Album & Song Chart History: Independent Albums". Billboard. ^ "Upcoming Releases". Hits Daily Double. HITS Digital Ventures. Archived from the original on June 17, 2015. ^ "Sublime with Rome Chart History: Alternative Songs". Billboard. Retrieved December 4, 2018. ^ "Sublime With Rome Album & Song Chart History – Rock Songs". Billboard. Retrieved June 4, 2015. ^ "Canadian Active Rock & Alt Rock Chart Archive: Alternative Rock - June 21, 2011". America's Music Charts. Retrieved June 21, 2011. ^ "Wicked Heart – Single by Sublime with Rome on iTunes". iTunes Store. Retrieved December 4, 2018. Reservoired Dog "Interview with Rome Ramirez of Sublime with Rome", NerdSociety.com April 24, 2010.